The Xline ™ 45W modern led linear lighting , which provides direct and indirect pendant lighting, are made with a high lumen output reaching 5000LM/W. 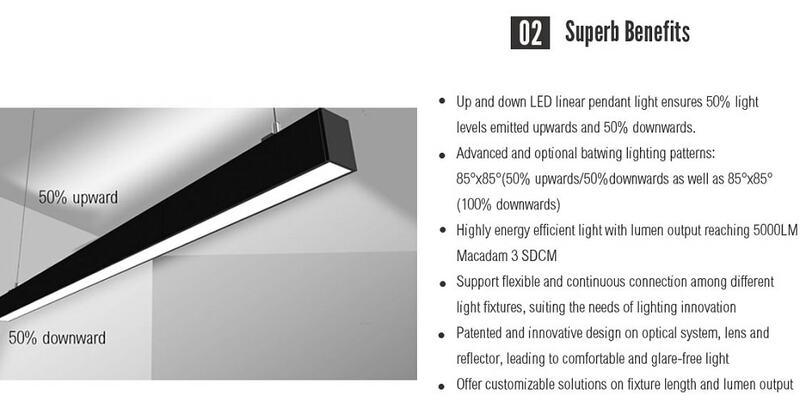 It is supplied with advanced batwing lighting distributions that covers two types of patterns: 85°x85°(50% light levels upwards and 50% light downwards) as well as 85°x85°(100%downwards). The linear fixture is sized at 1000mm long, equipped with high quality Samsung LEDs with a high life service of 50,000 hours. 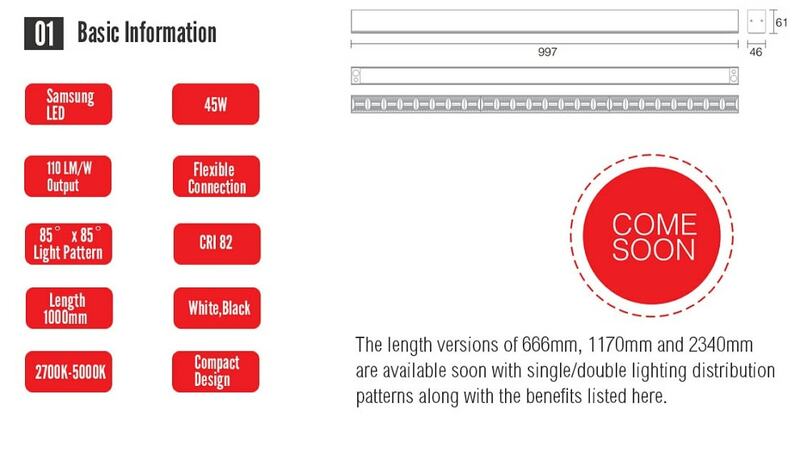 Some other length versions including 666mm,1170mm and 2340mm will be offered soon with both single sided and double sided light distribution patterns. Currently, there are two kinds of finishes available including black and white colors to suit the needs of different architecture styles. To bring more adaptive lighting solutions, we can provide customers with customizable lighting design service on fixture length and lumen output. One of the awesome benefits for such linear lighting lies in its flexible and convenient connection among the light fixtures. 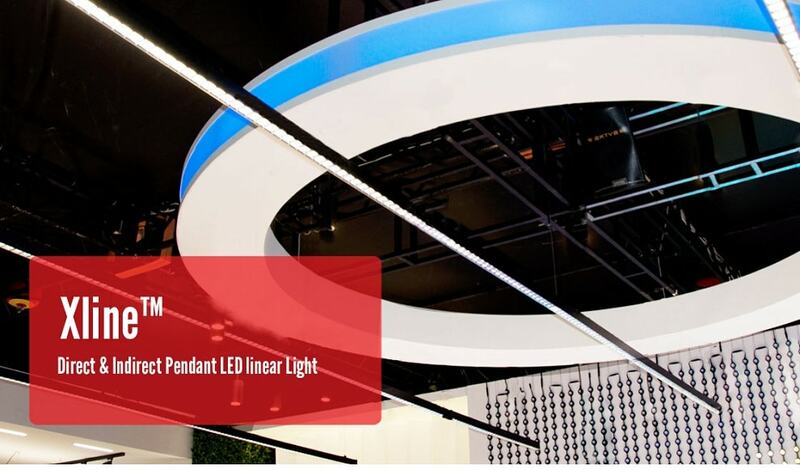 If you want to get the long linear pendant lighting system, you are able to connect the linear led fixtures easily and quickly for designing innovative and clean lighting. 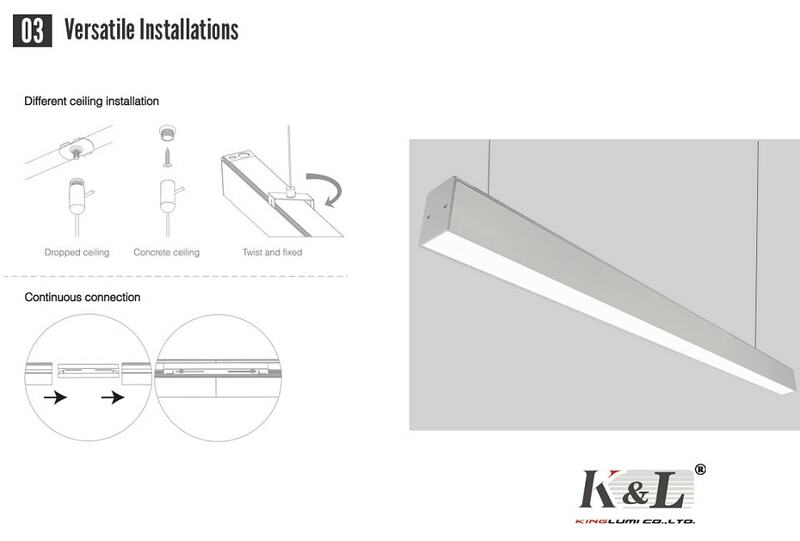 In terms of installations, there are three types of pendant installation options which include drop ceiling, concrete ceiling and fixed twist ways.